When I started a company my co-founders and I thought and discussed and argued about how we were different from our competitors, how there was a hole in the market, how we were going to win by going where no one had gone before. We got potential customers, suppliers, employees excited by talking about how we were different. In the things entrepreneurs care about most–price and control–VCs don’t seem all that different from each other. That’s not going to change and you’re not going to change it. Venture capital is already a business which is, at best, on the edge of being uneconomic**. In the times when VCs have been sucked as a group into competing on price, the whole sector has done badly. In the product world, if you are really good at something, you compete on price to take more market share. In the services world, where your expertise isn’t that scalable, when you’re really good at something you raise your price. VC is a service business and I often see the VCs with the best reputations offering a deal that is slightly worse than average and still being chosen as the funder. Conversely, I have often seen lesser known VCs or financial backers from outside the VC world offering much richer deals in order to be chosen. If you want to have price discipline (and you do) then you need to offer something besides price, and it better be good. Ask yourself: how do I distinguish myself from all the other sources of money out there? The company is not a great bet. The first situation happens. I’ve done a few of those, as has any venture investor worth their salt. But the majority of great investees are good enough bets to have many interested investors. If you want to be in these you need to offer more than just money. There are many ways to add real value through the process. I’ll talk about that in detail in a few posts. For now you need to think about positioning in general, about what you have to offer, both so you can generate the right kind of deal flow and so you can plan your investing strategy. 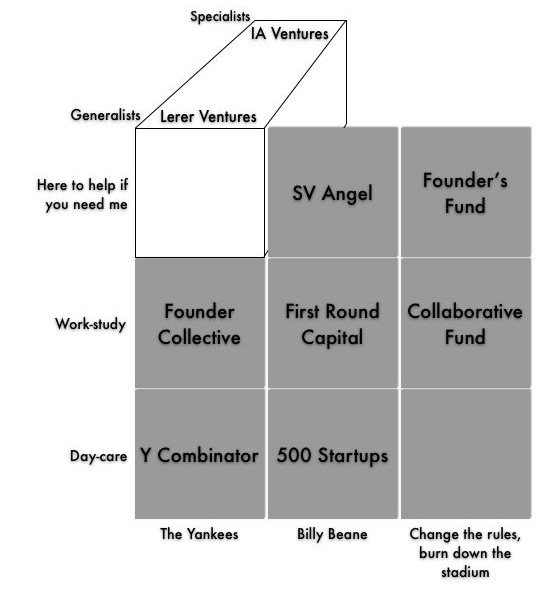 Here’s a potentially scurrilous example of positioning among early-stage VCs. Each of these funds has been very successful at being chosen by great companies to be their lead investor and they’ve each staked out different investing strategies. 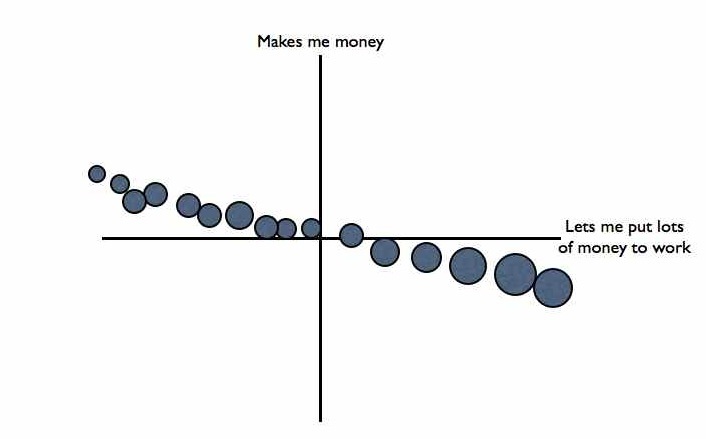 The x-axis is the amount of team, product and market risk they are willing to take (less to more as you move right.) The y-axis is how much operational help they offer, from incubator or incubator-like at the bottom to hands off at the top. The z-axis is how deeply they know a specific industry or technology***. In reality, none of these funds fits as well into their box as this graphic makes it look. And each offers something that this box doesn’t capture (not least, among this group, attitude.) But you should have a sweet spot, you should be able to articulate it, and, more importantly, it should articulate itself through your actions and communication. Entrepreneurs will find you if they know you are what they are looking for. Anywhere you choose in this cube has its tradeoffs. If you spend more time helping your entrepreneurs you have less time for other things. If you spend less time helping you are less valuable (assuming your help is valuable.) If you take less risk you either aim for lower returns or you face much more competition for investing in the deals. If you’re more specialized you need to work harder on finding potential investees but you are better able to evaluate the ones you do see. Where you fit depends on what you know, how much time you have and your personality. It will determine how you spend your time, how you generate dealflow, how you filter deals, and how much you can help. * For the VCs’ real customers, the LPs, it probably looks more like this. ** In terms of risk-return. *** The risk-return profile, all else being equal, gets better as you move from bottom right to top left. That’s why most funds are in the top left box. Of course, If all else is equal, maybe you should go find some other business where you do have an unfair advantage. Great series, Jerry. Very solid stuff. Appreciate your contributing to peeling back the curtain more and more. 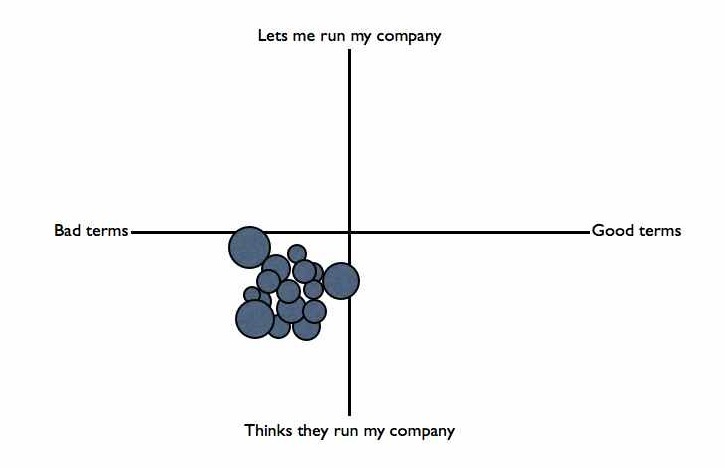 So important for entrepreneurs to understand where in your “cube” their prospective (or existing) investors sit…totally dictates expectations, working relationship, etc. Almost nobody actually has that conversation. And I love your plot of the LP-VC relationship in the footnotes!